Employment applications are not only an informal tool to gain insight into a potential employee’s past employers and personal references; they are also the foundation for properly placing an employee in a position that he or she is physically and mentally fit to perform. 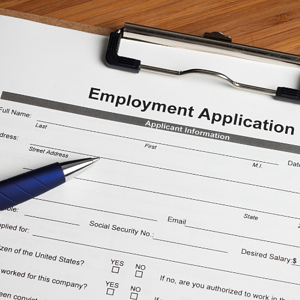 Additionally, employment applications are a resource to utilize should the employee later claim an on-the-job injury. Questions pertaining to the physical ability to perform the job, eligibility to legally work in the United States, and past criminal history are all important portions of an employment application that may present defenses to a future claim for workers’ compensation benefits. In McDaniel v. Colonial Mechanical Corp., 350 S.E.2d 225 (Va. Ct. App. 1986), the claimant sustained a work-related injury to his back, and an award was subsequently entered. The claimant was later released to return to his pre-injury employment; however, it was noted that he continued to complain of discomfort and lingering symptoms. The claimant was terminated from employment. The claimant sought employment with a new employer, and on his application he answered in the negative when asked if he had any physical limitations that would prevent him from performing the job. The claimant was hired, and not long thereafter suffered a back injury. The claimant filed a claim against the new employer. The employer defended the claim on the grounds that the claimant fraudulently procured his employment because he made material misrepresentations on his employment application. The Commission found in favor of the employer. On appeal, the Court of Appeals found: “A false representation as to physical condition or health made by an employee in procuring employment will preclude workers’ compensation benefits for an otherwise compensable injury if a causal relationship between the injury and the false representation is shown and if it is also shown that (1) the employee knew the representation to be false, (2) the employer relied upon the false representation, and (3) such reliance resulted in the consequent injury to the employee.” The Court of Appeals found that all of these elements were met and affirmed the lower findings in favor of the employer. During the pre-hire application process, examples of what can be asked on an employment application include: Can you perform the essential functions of this position with or without accommodation? Do you use illegal drugs? Do you have the required licenses/degrees to perform this job? Have you been convicted of a crime? Are you a U.S. Citizen? Are you legally eligible to work in the U.S.? Examples of what can NOT be asked on an employment application include: Have you ever had a workers’ compensation claim? Do you have any disabilities? Have you ever been hospitalized? Have you ever been treated for drug addiction or alcoholism? Are you currently taking any prescription medications? However, in instances where a position affects public safety (ex. school bus driver), questioning may extend to the use of prescription medications and drug addiction/alcoholism. Additionally, during the post-hire process further information may be sought from an employee relevant to their ability to perform a job, so long as the same information is sought from all employees in the same job position. Please contact any of our employment law attorneys for further assistance with this topic specifically. If you think you may have a misrepresentation on an employment application defense, it is important to determine whether the current injury can be linked to the misrepresentation. For example, if an employee applies for a job with a 50 lbs. lifting requirement and fails to reveal prior lifting restrictions of 30 lbs. due to a prior back injury, and thereafter injures their back while lifting 40 lbs., it is likely that the injury can be linked to the misrepresentation. However, if the job requires a 50 lbs. lifting restriction and the employee has a prior 30 lbs. lifting restriction that they failed to reveal due to a prior back injury, but injures their knee while stepping down from a ladder, it is unlikely that the injury can be linked to the misrepresentation on the employment application. When investigating a claim and reviewing the claimant’s medical records and personnel file, make it a point to compare the claimant’s prior medical condition/restrictions, employment application, and a description of their new injury. A material misrepresentation on their application could present a bar to an otherwise compensable claim. Please contact any of our workers’ compensation attorneys for further assistance with this topic. Joseph T. McNally, Associate. Joe's practice is focused on representing employers and carriers defending workers’ compensation claims in Virginia. Previously, Joe represented Plaintiffs before the Workers' Compensation Commission, informing his experience with all sides of matters.